Nicea Eliely drives past Deja Church. Hannah Whitish scored seven of her team-high 17 points in the final 3:05 and the Nebraska women’s basketball team played spectacular defense to outlast No. 24 Michigan, 61-54, in the quarterfinals of the Big Ten Tournament at Bankers Life Fieldhouse on Friday night. With the victory over the sixth-seeded Wolverines, the Huskers will advance to Saturday’s semifinals to take on No. 2 seed and 17th-ranked Maryland. Tip-off between the Big Red and the Terrapins will be at approximately 7:15 p.m. (CT) with a live national telecast by the Big Ten Network. 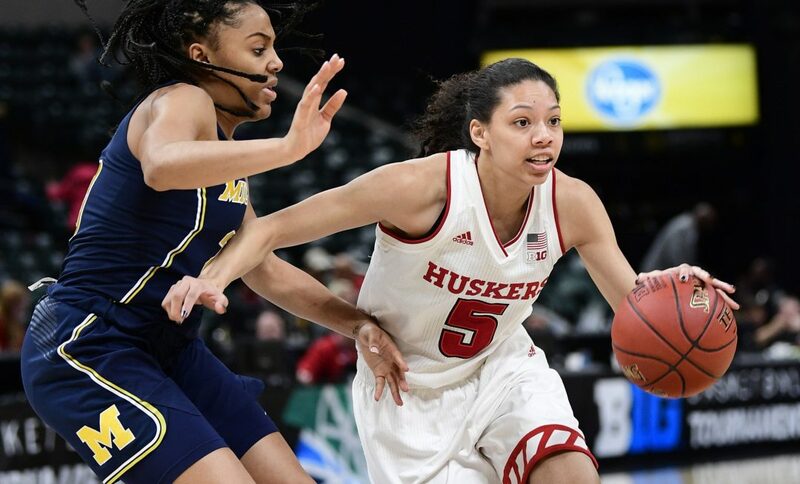 Nebraska, who went 11-5 to finish third in Big Ten regular-season play, improved to 21-9 overall by avenging a regular-season loss to the Wolverines. Michigan slipped to 22-9 on the season. In a low-scoring slugfest through three quarters, Nebraska carried a 37-33 lead to the final period before the two teams unleashed more aggressive all-out attacks in the final 10 minutes. The Huskers were able to make more plays at both ends of the court than the Wolverines, outscoring Michigan 24-21 in the final period. Whitish, a second-team All-Big Ten guard from Barneveld, Wis., scored seven of Nebraska’s final nine points to help secure the win. With Nebraska clinging to a 51-49 lead, Whitish scored on a layup after a tremendous pass by Jasmine Cincore to push NU’s lead to four. Michigan’s Hallie Thome, who led all scorers with 21 points on the night, hit a pair of free throws to pull the maize and blue back within two before a huge three-pointer by Whitish extended the Husker lead to 56-51 with 1:14 left. Thome hit 1-of-2 free throws with a minute left to cut the margin back to four, before Nicea Eliely scored a strong drive to the rim to push the lead to 58-52. Eliely finished with 12 points, six rebounds, an assist, a block and two steals in a strong all-around effort. Nebraska then shut out the Wolverines the rest of the way, and Whitish sealed the victory with two free throws with 13.4 seconds left to give the Huskers their first Big Ten Tournament victory in the last three seasons. It was also NU’s first-ever tournament win over Michigan, while snapping a streak of three straight regular-season setbacks to the Wolverines. While Whitish and Eliely did the most damage for the Big Red on offense, freshman Kate Cain and senior guard Jasmine Cincore held the line for the Husker defense. Cain, a Big Ten All-Defensive Team selection, set the Nebraska conference tournament record with seven blocked shots. Cincore added three blocks of her own as Nebraska set a team conference tournament record with 12 blocks. Cincore added nine points, six rebounds, a game-high five assists and a steal for the Big Red. Cain managed seven rebounds and three assists to go along with six points. As a team, Nebraska held Michigan to just 31.1 percent (19-61) shooting for the game, including 6-of-19 threes. All-Big Ten senior guard Katelynn Flaherty hit five of Michigan’s threes to finish with 17 points. The Wolverines also hit 10-of-14 free throws. Nebraska managed 38.1 percent (24-63), including a strong 56.3 percent (9-16) in the second half. The Huskers went 7-of-23 from three-point range and 6-of-10 at the free throw line. The Big Red outrebounded the Wolverines, 45-38. Both teams committed 15 turnovers. The Huskers took a 27-23 lead to the halftime locker room in hard-fought first half. The Big Red and Wolverines went back and forth in the first quarter with seven lead changes until Cain scored her second basket with 2:31 left to give Nebraska a 12-11 lead. 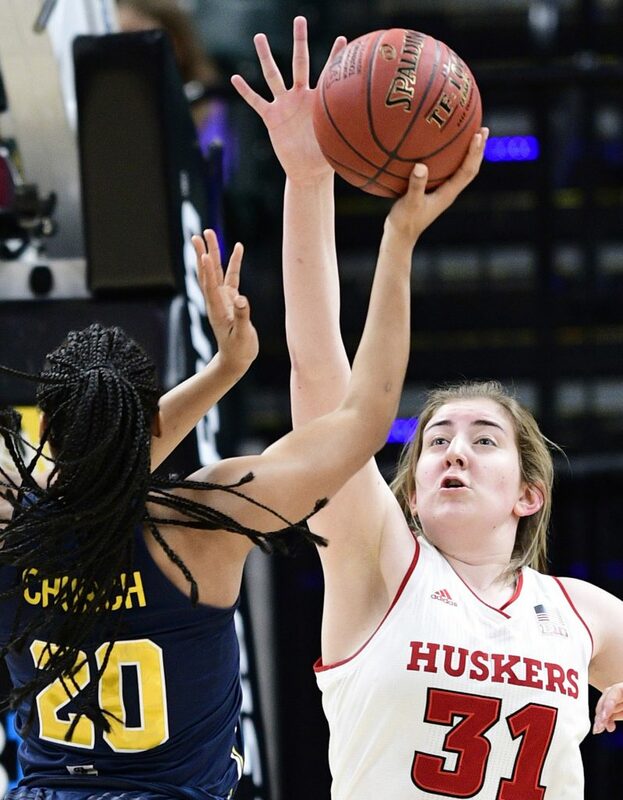 The Huskers, who held Michigan scoreless for the final four minutes of the quarter, then got a corner three from senior Emily Wood to close the quarter and take a 15-11 lead to the second period. The Huskers never relinquished the lead again. Nebraska built a pair of six-point leads in the second quarter, the last time on a three-pointer by liely with 2:18 left in the half to make it 27-21, but Michigan’s Deja Church scored the final two points of the half to end nearly another four-minute scoreless stretch for the Wolverines. Church joined All-Big Ten teammates Flaherty and Thome with six points apiece, while Akienreh Johnson added five points to account for all of Michigan’s scoring in the half. Whitish led the Huskers with seven first-half points, while Cain pitched in six points, five rebounds and five blocked shots. Simon contributed five points, while Eliely, Wood and Janay Morton all pitched in three points in the half. Morton finished with five points in the game, while adding three big rebounds and a pair of steals. The Huskers hit 32.4 percent (11-34) of its their first-half shots, including 5-of-17 threes (.294), but did not attempt a free throw. The Huskers won the first-half rebound battle 25-21, but lost the turnover battle 6-5 in the opening 20 minutes. Nebraska held Michigan to just 25 percent (8-32) shooting, including just 2-of-6 threes. The Wolverines went 5-for-5 from the free throw line in the opening half. With the win Nebraska advances to the Big Ten Tournament semifinal, where they will take on #2 seed Maryland on Saturday March 3 at 7:30 p.m. CST. The win for Nebraska is their 21st win of the season, a plus-14 win improvement from last season (7). The 14-win turnaround is tied with Rutgers for the most in the nation this season. Nebraska is 11-3 away from home this season. The Huskers are one of four Big Ten teams to produce at least 10 wins away from home this season. The 12 blocks by Nebraska are tied for second most for a team in a Big Ten Tournament game. Freshmen Kate Cain had seven blocks in the game. Cain owns the Nebraska single season record with 98 blocks and has a block in all 30 games this season. Cain’s 98 blocks this season exceed the previous top two totals by Husker freshmen (54, Janet Smith, 1979; 42, Kathy Hagerstrom, 1980) combined. Cain moved into ninth on the Huskers’ all-time list for career blocks. Cain has recorded two or more blocks in 25 games this season. Cain’s seven blocks are a Nebraska conference tournament record (for any conference). Cain’s seven blocks are tied for second most for an individual player in a Big Ten Tournament game. Hannah Whitish led Nebraska with 17 points, her 17th game this season reaching double figures. Nebraska held a 34-20 advantage in points in the paint. Nebraska held Michigan to 22 points below their season average. Kate Cain blocked seven shots.